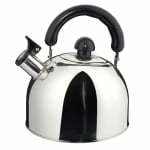 The Paderno A4191402 whistling kettle can be used with any heat source, including induction equipment. Constructed of stainless steel, it resists rust, scratches, and dents. Staying cool to the touch, this handle is safe and comfortable to grip.